Otto Dix was, together with Max Beckmann and George Grosz, one of the most important German artists of the Weimar era. Like many of his compatriots, he was emotionally scarred by his experiences in World War I and became a vociferous social critic in the 1920s. His War series ( a cycle of etchings) is one of the seminal anti-war statements of the 20th century. In addition to indicting the perpetrators of what he considered an amoral war, Dix turned his lacerating pen and brush on the corruption which he found endemic to German society: prostitution and the vices of the ruling class were among his most frequent subjects. Named a Professor at the Dresden Academy in 1927, he was (not surprisingly) removed from his post almost as soon as Hitler came to power in 1933. Banned as "degenerate" by the Nazis, Dix was unable to continue producing the kind of acerbic social commentary for which he is best known. In his later years, he created fairly innocuous landscapes and portraits. Otto Dix was born to a working-class family in Gera-Untermhaus. In 1914, following several years at the School of Applied Arts in Dresden, Dix volunteered for military service and was assigned to command a machine-gun unit on the Western Front. He served for the entire duration of World War I and fought on both fronts. This experience fueled his attacks on pro-military bourgeois society. Subject matter such as war cripples and sexual deviants, treated both with bitter humor and in a more serious, almost frightening manner, dominate his work. However, Dix's success was short-lived and, by 1930, the National Socialist Party had targeted him as "subversive." 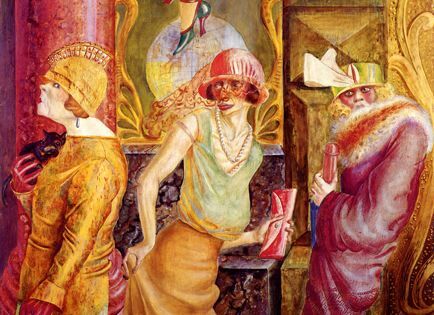 In May of 1933, Dix was asked to resign from his post at the Academy, and in September of that same year, his work appeared in the exhibit "Images of Decadence in Art." The press was particularly vehement in attacking Dix's War Cripples. By 1934, he had been forbidden to paint, and in 1936, he moved to Switzerland, where he painted only landscapes. Dix was also among the artists selected for the "Degenerate Art" exhibit in 1937, and the following year he sent works to a protest exhibition organized by the Burlington Galleries in London. In 1938, the Nazis destroyed or sold over 260 of his works. Dix seems to have moved about Europe during the Second World War, spending time in France, as well as, Germany and Switzerland. After the war, he returned to Germany. In 1956, he was named a corresponding member of the German Academy, and he received various honors throughout the rest of his life.